Following on from the recent news that the Snom300 is compatible with OCS 2007R2, Snom have also joined the “Compatible Devices Program for Lync 2010”. This means that it is continuing it’s development of “OCS” firmware to include the new features that will be present in the future Lync release. Lync is the new name Microsoft has given to the next version of OCS, it was generally referred to as Wave14 until this official name was released. Lync is currently at the public beta stage so not yet ready for production use. ProVu will be testing Lync with Snom phones in due course and Snom themselves will be developing the new features possible with Lync. Last week we brought you the news that the snom 300 has achieved official certification from Microsoft for use with the Office Communication Server 2007 R2. This is big news for any one involved with snom phones as OCS is gradually making it’s way into some big corporate customers. This is the first step in getting all snom phones with OCS firmware certified, this should just be a matter of time since the firmware on each is basically the same code base. Of course, ProVu as a Snom distributor are today launching their Snom OCS support service. We can support Snom phones on Microsoft OCS Platforms. Snom M9 phones are in stock and are shipping. I’ve you’ve a back order then they will be shipped today. If you are planning to use a protalk door entry system with Cisco call manager, then you may be interested in this. I got it all set up on our Cisco Call Manager. Pretty simple really, all works fine. Hopefully will get it installed into the new office next week when we have access to the existing latch mechanism. Using our SIP Door Entry Phone and an iPhone it’s easy for us to check who is ringing the door! <%ThickBox(http://blog.provu.co.uk/media/1/20100713-protalk-sip-door-phone-on-iphone.jpg|Protalk SIP Door Phone on iPhone)%></p> <p>Here, we can see Tim as he is waiting to be let into the building. The Snom M9 isn’t launched in the UK yet. Expected in a few weeks. Are few (less than 5) people in the UK have been testing EU versions of the product, but these are strictly not for resale. We’ve had the product on order for over 6 months now (there have been a few delays) we’ll have UK stock from the first shipments out of Snom in Germany. As a reseller, you should always makesure you buy product from a Snom Certified Distributor (of which there are only two in UK). So please can you tell me who has told you they have product in already? I trust this clarifies, and please let me now if I can help further. Do you have any recommendations for integrating Snom phones with Outlook 2007? I hope you can help, last month I bought a Snom370 telephone through yourselves, and wondered if you have a SIP enabled portable telephone as an available option ? We have a team who walk between buildings covering up to 100 sq.meters. We have already tried the Snom M3, but this does not have a far enough reach from the base station. You could try a Snom M3 Repeater. This will extend the range. If you can arrange the base station in the middle, and repeaters around in a circle then you can cover a huge area. Calls hand over between repeaters as you walk. Other option is something like a Gigaset S685. 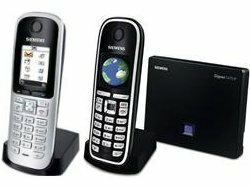 The handsets have a `best base` feature where you can register a handset to more than one base station. You need to be a little bit clever with setting up SIP accounts. Each handset needs a SIP account for each base. These then have to be setup to all ring together. This solution does not allow handover while calls are in progress. A long term option would be the Snom M9 phone. A roaming feature is in the roadmap for this phone, but probably at least 1 year away from launch.